You can have happier, more productive employees for a tiny investment When you add a full service vending, coffee services and water delivery solution to your Vista office. Munch a Bunch Vending has been doing this for years. We know what motivates employees to work harder and how to keep them focused on work. Our Vista vending machine service will take your workplace to the next level. Our vending machines are installed for free, and come with a host of name brand products like Pepsi and Coca Cola. We have food vending machines, snack vending machines, candy vending machines, coffee vending machines, healthy choices in vending machines and so much more. You choose the products and vending machines that best fit your particular needs in Vista. 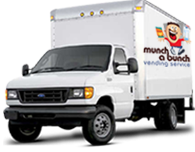 All of our Munch a Bunch Vending machines are energy efficient, dependable and modern. 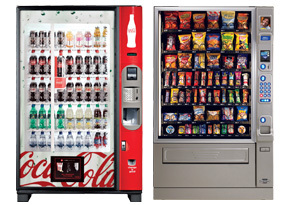 Vending choices include traditional, subsidized and free vending for your valuable employees in Vista. Another option is to have us install a Micro Market, basically an open air convenience store in your building. Keep your employees happy and on task with the best break room possible. Munch a Bunch Vending office coffee service makes a perfect cup of coffee available 24 hours a day. We have a huge selection of brand name coffees and teas and both traditional and single cup brewing options. We'll also keep the break room fully stocked with a wide selection of coffees, teas, brewing equipment, cups, filters, plates, napkins, paper towels, creamers, sweeteners, sugar and all the other condiments needed. Do you have the drinking water you need in Vista? We can take care of that need too with our plumbed in water filtration services. You won't ever run out of crystal clear drinking water again when you have Munch a Bunch Vending take care of your office water needs. Call us at 760-480-0870 or email us at mabvending@yahoo.com . See what superior service means!